Hamilton envisions a future in which teleportation portals are used for garbage disposal, irrigation, and carbon sequestration, and in which the now-useless bridges and highways have been converted into parks and shopping centers. He also predicts that cheap teleportation would spell the end of the hotel business. Sounds like a recipe for mass unemployment! With “The Predator” now out in theaters, the franchise’s famed antagonist, whose name is Howard, is ready for a new chapter. With new headshots and a positive attitude, Howard jumps into the Hollywood grind in search of the next great role. …The audience at Fantasticon was consistently among the nicest I’ve encountered. One of the program items I made a point of seeing on Saturday was a talk led by the dauphines of Swedisn and Danish fandom, Fia Karlsson and Sanna Bo Claummarch respectively, titled Come with me if you want to squee! whose thesis was, simply, there should be no guilty pleasures: we should feel free to enjoy what we enjoy, and break down barriers of “you can’t like this because you’re a girl, or boy, or too old, or to young” and so on. And this is something we need to keep reminding ourselves of because those barriers are continually being reconstructed for us. Now that I am A Published Author people can read what I write in an “official” way; but part and parcel of that is that the publisher and Amazon will both try to quantify me like census takers because that’s as indivisible and fundamental a component of marketing books as carbon is a component of sugar, and we authors and fans are complicit too when we try to promote the work by putting it in a familiar context (“you like young adult romances with aliens, right?”). We owe it to ourselves as writers and fans to break down the barriers even as we take part in building them up through how we present our work. (4) A SAGA OF THE MEXICANX INITIATIVE. Hector Gonzalez has posted two more entries in his account of Worldcon 76. Now, the science fiction angle. The easiest way would be playing with my specialty: salsas. I opted for making 7 salsas, each spicier than the previous one. The first one that came to my mind was Soylent Verde, because it was an easy pun. My dear Aussie friend Paul CZ came up with a couple of the other names: Picard de Gallo?—?Make It Salsa happened while eating BBQ, while Obi Juan Chipotle was sent over Messenger later that same day. (5) A GOLDEN AGE. M M Owen, in ”Our Age of Horror” on Aeon, interviews Joe Hill, Ramsey Campbell, and Daid J Skal to discuss why horror remains so popular. Plus he begins his piece by discussing Ray Bradbury’s 1955 story “The Next in Line.” which he thinks is one of the great horror stories of the 20th century. Our present era is one in which the heart of culture is blowing hard upon a coal of fear, and the fascination is everywhere. By popular consent, horror has been experiencing what critics feel obliged to label a ‘golden age’. In terms of ticket sales, 2017 was the biggest year in the history of horror cinema, and in 2018, Hereditary and A Quiet Place have been record-breaking successes. In both the United States and the United Kingdom, sales of horror literature are up year over year – an uptick that industry folk partly attribute to the wild popularity of Netflix’s Stranger Things (2016-). And the success isn’t merely commercial. Traditionally a rather maligned genre, these days horror is basking in the glow of critical respectability. As The New York Times remarked this June, horror ‘has never been more bankable and celebrated than it is right now’. Born September 23, 1908 – Wilmar H. Shiras, Writer. Also wrote under the name Jane Howes. Her most famous piece was In Hiding, a novella which was published by John W. Campbell, Jr. in Astounding Science Fiction in November 1948 – eventually to be included in the The Science Fiction Hall of Fame novella anthology — and widely assumed to be the inspiration for The Uncanny X-Men that Stan Lee and Jack Kirby would release 15 years later. Born September 23, 1936 – Edgar L. Chapman, 82, Scholar and Critic. I’m fascinated by genre academics. This one is a specialist on Philip José Farmer – not exclusively, but that’s his main area of interest. So let’s look at some of what he’s published: From Rebellious Rationalist to Mythmaker and Mystic: The Religious Quest of Philip José Farmer, The Magic Labyrinth of Philip Jose Farmer, The Fabulous Riverworld, and On Philip Farmer. Born September 23, 1956 – Peter David, 62, Writer. Despite my general aversion to works based on media series, I’m going to single out his Babylon 5 work as most excellent. Among his fiction work of a non-media undertaking, his Modern Arthur series is very good as is his quite silly Sir Apropos of Nothing series. Let’s by no means overlook his very, very impressive work in comics covering series such as Doctor Who, Teenage Mutant Ninja Turtles, Aquaman, Super-Girl, and Young Justice. He has won a number of Awards including an Eisner Award for Best Writer/Artist Team with Dale Keown for The Incredible Hulk. Born September 23, 1957 – Rosalind Chao, 61, Actor. Perhaps best known to genre fans as the botanist Keiko Ishikawa O’Brien from Star Trek: The Next Generation and Deep Space Nine, she grew up working part-time in her parents’ restaurant near Disneyland. Her early genre appearances include guest roles in episodes of the TV series The Amazing Spider-Man and Beauty and the Beast and the TV miniseries Intruders. She appeared in the 2003 version of Freaky Friday, and has a role in the upcoming live-action movie version of Disney’s Mulan. Born September 23, 1967 – Justine Larbalestier, 51, Writer, Editor, and Critic. An Australian author of fiction whose novels have won Andre Norton, Carl Brandon, and Aurealis Awards, she is probably best known for her comprehensive scholarly work The Battle of the Sexes in Science Fiction which was a Hugo, Locus, and Aurealis finalist. Her Daughters of Earth: Feminist Science Fiction in the Twentieth Century, an anthology of SFF stories and critical essays by women, won The William Atheling Jr. Award. Born September 23, 1975 – Katrina Browne, 43, Actor. A New Zealander who has appeared in numerous genre properties including The Lion, the Witch and the Wardrobe, Xena: Warrior Princess, Hercules: The Legendary Journeys, Young Hercules, Power Rangers DinoThunder, and Power Rangers Ninja Storm. In this Over the Hedge, we find out Alexa has limits on what it can do to affect your Kurma. (9) TRUE CONFESSIONS. J.W. Ocker kicked off the Halloween season by watching the 1983 Disney/Ray Bradbury flick Something Wicked This Way Comes. Oh, and by the way…. For whatever stupid, random twists that the universe throws at this planet to keep itself entertained, I happen to own the head of Will Halloway. Like, the actual physical prop. It’s from the scene where he and Jim are running from the carnival at night and come full stop at a small guillotine that beheads a version of Will right in front of them. The severed head prop was created by Rob Schiffer, a famous Disney make-up artist who was responsible for turning Jonathan Winters into a pumpkin in the Halloween Hall of Fame show and a dog into a monster in the original Tim Burton short Frankenweenie. He also worked on such properties as The Black Hole, TRON, and Escape to Witch Mountain, as well as movies for other production houses. I mean, he did the makeup on everything from The Wizard of Oz to Whatever Happened to Baby Jane? There’s a new battlefield in the culture wars: comic books. The alt-right now has gotten in the business, led by a buxom, Confederate flag-waving superhero named Rebel and a white vigilante who turns immigrants over to ICE. (11) DOLLARGATE. Whatever else #ComicsGate is, Vox Day and Jon Del Arroz hope it’s a revenue stream. However, one of Day’s moves has offended some people and made both VD and JDA objects of social media scorn. Castalia House apologist Bounding Into Comics tries to run interference for them in “Let’s Not Turn #Comicsgate into #Dramagate”. With coordinated attacks coming from all sides, it’s more critical than ever that #Comicsgate members keep their eye on the prize and don’t turn into #dramaqueens who favor sniping and infighting over solidarity. Sadly, for those supporting this consumer revolt in the name of good comic books, and for the high profile figures within it, recent history may not be on our side. On September 3rd, 2018, Alt-Hero publisher Vox Day announced his prospective Comicsgate imprint right here on Bounding Into Comics, and it would be an insult to diarrhea to say that the Comicsgate community understandably lost their crap in response. Whether Vox Day was trying to do something he deemed to be positive for the movement, or he was just trying to co-opt it a la Sad Puppies…or both, is mostly irrelevant; the fallout from his move was quite real, particularly when it came to author and occasional BIC contributor Jon Del Arroz. Over the course of 24 hours, Del Arroz, whose Sci-Fi and comic book work are both published by Day’s imprints, was not only taken to task for his friendship with Day, but he would see some of his sociopolitical positions erroneously conflated with Day’s. When the accused makes it crystal clear that they disagree with someone else’s specific politics and yet they are still being taken to the woodshed for them, it’s a pretty clear case of reactionary outrage…. (12) RECOVERING FROM A FORMER GOOD IDEA. BBC reports: “France removes toxic tyres from failed reef project”. The operation is costing well over a million euros ($1.1m; £898,000) and is part-funded by the tyre manufacturer Michelin as well as the French state. The divers are supported by a boat with lifting equipment. Fish had been avoiding the area. (13) LEGO PORG. SYFY Wire has made note that you will soon be able to buy your own Porg; some assembly required (“LEGO just brought a life-size Porg to Earth”). 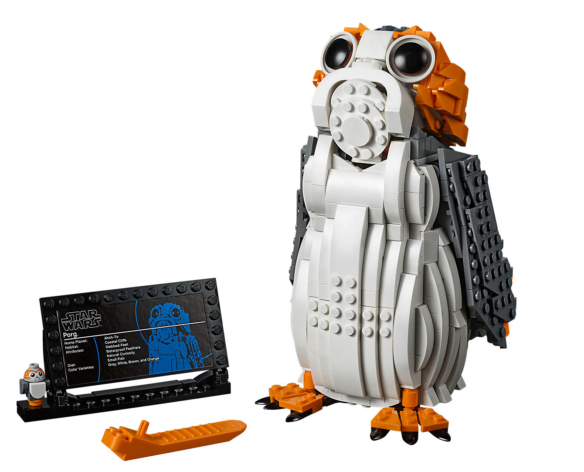 By now, we’ve seen just about all the Porg merch in this galaxy—Porg shirts, Porg Funko pops (of course), Porg bobbleheads, furry animatronic Porgs, a borderline terrifying Chewbacca and Porg backpack, and now a life-size LEGO Porg. Yes, this is for real, and it’s one Porg that Chewie can’t slow-roast over a fire. (14) DISNEY STREAMING. Variety has a report (“Loki, Scarlet Witch to Get TV Series on Disney Streaming Service”) that the as-yet unnamed Disney streaming service will have exclusive content from the Marvel Cinematic Universe. Disney is enlisting Earth’s Mightiest Heroes as the company prepares to launch its upcoming streaming service. The entertainment giant is in early development on an ambitious plan for a number of limited series centered on popular characters from the Marvel Cinematic Universe. These series will likely include shows centered on Loki and the Scarlet Witch, along with other beloved superheroes who have yet to appear in their own standalone movies. (1) NEW DOCTOR WHO COMPANION. ScreenRant reports the “Doctor Who Season 10 Companion To Be Revealed This Weekend” – in the middle of the BBC One Match of the Day Live soccer broadcast. [A] new companion has now been cast, the big reveal of exactly who that companion is, will be made this Saturday, April 23rd, on BBC1. The announcement will be made during half-time of the soccer match between Everton and Manchester United, at approximately 6pm GMT. The news will be posted on all Doctor Who social media sites as it’s announced, enabling viewers across the world to all find out who has been cast at the same time. Hey guys! The new Doctor Who companion will be revealed on @bbcone MOTD Live this Saturday, during half time of the FA Cup semi-final between Everton and Manchester United! (2) VIRTUOUS SIGNALING. Rob Boffard at Medium says “You can talk to the International Space Station right now. Here’s how to do it”. Do you have what it takes? Of all the things that shouldn’t be possible but are, talking to the International Space Station ranks right up there with Steph Curry’s basketball skills and the existence of Donald Trump. Think about it. How weird is it that NASA can put a $150bn space station into orbit, which can then be contacted by anybody on Earth? Even you? It’s one of those things that gives you pause?—?the kind of thing you’re vaguely certain is against the law, somewhere. It’s not something you’re going to be doing tonight?—?not unless you have the relevant equipment already to hand. It takes a little bit of work. But it’s entirely possible, even for those of us who aren’t geeks…. (3) BLOWN AWAY. James Bacon highly recommends The Great British Graphic Novel Comic art exhibition at the Cartoon Museum on the Forbidden Planet blog. This is a phenomenal experience, it exceeded my expectations and I was blown away by the calibre of the artwork on display. The Cartoon Museum has amassed the finest examples of comic art, an incredible mix of exemplary work, providing a beautiful tapestry of the history and breadth of the greatest works from Britain for public consideration…. Soon I was looking at lovely pieces, starting with Hogarths ‘A Harlots Progress’ from 1732, ‘The Bottle’ from 1847 by George Cruikshank, ‘Ally Sopers; A Moral Lesson’ from 1873, Ronald Searle’s Capsulyssese from 1955, written by Richard Osborne. All giving one a real sense of history, showing that illustrated stories are nothing new in Britain. Then as I rounded a corner I saw a grouping of Commando Comics placed next to a full colour cover of Charley’s War, and four pages of this seminal work of the First World War. Undoubtedly Pat Mills and Joe Colquhoun’s masterpiece is indeed a crucial addition here, but I had a feeling of true appreciation of the comic form when I saw this colour cover and four original pages lined up. Juxtaposed with this was My Life in Pieces, The Falklands War by Will Kevans from 2014. Original art, cover and concept sketch made for a great grouping…. (4) CHABON AND HASBRO? Birth.Movies.Death almost cannot be believed this time — “Michael Chabon And Brian K. Vaughan To Make Hasbro Cinematic Universe Worth Taking Seriously”. Is there a way to get G.I. Joe taken seriously? Last December, word came out that Hasbro was going to try their hand a making a cinematic universe based on their various toy properties, namely G.I. Joe, Micronauts, Visionaries, M.A.S.K. and ROM. I was a little flip about it. But now Hasbro, lead by Akiva Goldsman, has assembled its writers room and it’s no laughing matter. The big stars of the list are The Amazing Adventures of Kavalier & Clay’s Michael Chabon (who also worked on Spider-Man 2), Brian K. Vaughan, who you should know from comics like Y: The Last Man, Ex Machina, Saga, Runaways and a bunch of other impressive titles, and Nicole Perlman, co-writer of Guardians of the Galaxy and Captain Marvel. (5) SPACE MARINES. If you remember Space: Above and Beyond, you may be ready for the Space: Above and Beyond 20th Anniversary celebration on Saturday, August 6 at the Marriott Burbank Airport Hotel. In 1996, Fox Studios produced the TV series: Space: Above And Beyond (aka S:AAB). The show had Drama, action, mystery and followed the lives of a diverse group of U.S. Marine Space Aviators while fighting against a powerful alien force on the ground, in the air and in outer space. It was part Top Gun, part James Cameron’s Aliens, and all exciting! This short lived show (1995 to 1996), which fell victim to scheduling conflicts like Joss Whedon’s Firefly, is considered one of the best of Military Science Fiction series to air and is deserving of a convention of its own…. VIP tickets and Premium tickets are both on sale NOW at early-bird prices, and general admission tickets will go on sale starting May 1st. (6) BEFORE THEY WERE BOTTLED. Syfy may order a pilot for David S. Goyer’s Superman prequel series Krypton. The series, set two generations before the destruction of Superman’s titular home planet, would tell the story of the man of steel’s grandfather as he fights to restore the family honor of the House of El after it has been shamed. The pilot will be produced by Warner Horizon Television. Goyer — who penned the screenplays for “Batman Begins,” “Man of Steel” and “Batman v Superman: Dawn of Justice” — will write the pilot with Ian Goldberg. He will executive produce through his company Phantom Four with Damian Kindler, who will serve as showrunner. Colm McCarthy is set to direct the pilot. (7) KIT WEST OBIT. British special effects artist Kit West (1936 – 17 April 2016), known for his work in Raiders of the Lost Ark and Return of the Jedi, died April 17. Guy Hamilton, who directed four James Bond films, has died aged 93. Former 007 actor Sir Roger Moore tweeted that he was “incredibly, incredibly saddened to hear the wonderful director Guy Hamilton has gone to the great cutting room in the sky. 2016 is horrid”. Hamilton directed Sir Roger in Live and Let Die and The Man with the Golden Gun. He also directed Sir Sean Connery in Goldfinger and Diamonds are Forever. …Speaking about his style of directing he said he wanted value for money. April 21, 1997 — Ashes of Star Trek creator, Gene Roddenberry, journeyed into space. (10) CAN YOU SAY “CANONICALIZATION”? Will Frank discusses “The Duties of the Hugo Administrative Team” in a MidAmeriCon II blog post. Once that’s done, we have our preliminary finalists. That’s when we start reaching out to nominees, letting them know they’ve been nominated, and a bit about the awards. That can be surprisingly difficult if we don’t know people’s email addresses. Sometimes, they’re public…but fairly often they’re not. There’s a certain amount of Googling, guessing, or asking people with impressive Rolodexes just to figure out a valid email address sometimes. (11) SELECTIVE QUOTE OF THE DAY. Kate Paulk says Sad Puppies have a future, in “Miscellany” at Mad Genius Club. In other news, this of the Puppy-related kind, I’ve heard rumors from several sources (but nothing official, alas) that more than 4000 Hugo nomination ballots were cast. I’ve also heard there are some saying that Sad Puppies 4 is a nonentity, that it’s run out of steam, it’s dead, pining for the fjords, gone to a better place… (erm, sorry?). Well, no. Sad Puppies 4 is waiting to hear who the nominees (*ahem*. The Hugo Site says they aren’t being called nominees any more. They’re ‘finalists’ from a shortlist. Whatever) are before congratulating them for their recognition, whoever they are, and starting the next round of campaigning to boost involvement in the Hugos process. (12) CAT PITCHER. He’s mad as a wet you-know-what! “Timothy Under Attack by SJW Warrior Feminist Filers” at Camestros Felapton. A certain “website” which I shall not name because I shall not provide it with anymore publicity because I am sure nobody but a tiny number of far left Bernie Sanders supporters in a gated community ever read, as they sip champagne frappucinos in their la-di-da literati bookclub but whose name rhymes with smileearnestbevinbeventy, has SELECTIVELY QUOTED ME in a truly monstrous way to suggest that I am nothing but a poo-poo head! The calumny! The outrage! (13) A MULTIPLE-CHUS PANEL. This program idea was dropped in the MidAmeriCon II suggestion box…. (14) IN FACT IT’S COLD AS HELL. Science Alert reports “An abandoned probe just discovered something weird about the atmosphere of Venus”. The European Space Agency’s (ESA) Venus Express probe spent eight years collecting information on Venus before plunging down to the surface and out of range back in November 2014. But now we finally have the last batch of data it transmitted back to Earth before going offline, and there are some big surprises in all those recordings. Turns out, the polar atmosphere of Venus is a whole lot colder and a lot less dense than we previously thought, and these regions are dominated by strong atmospheric waves that have never been measured on Venus before. Maddie Stone from Gizmodo reports that the Venus Express probe found polar areas of Venus to have an average temperature of -157 degrees Celsius, which is colder than any spot on Earth, and about 70 degrees lower than was previously thought. This is rather surprising, considering Venus’s position as the hottest planet in the Solar System overall. Not only is Venus much closer to the Sun than we are, it also has a thick, dense cloud layer that traps heat. However, Venus Express also found that the planet’s atmosphere was 22 to 40 percent less dense than expected at the polar regions. (15) FAMOUS FURNITURE. Heritage Auctions now calls it “The Chair Heard ‘Round the World”. The online and print publicity pieces for J. K. Rowling’s chair reached over 90 countries, plus all 50 states and all news aggregator sites. It saw total media coverage nationwide, with special interest in New York, Silicon Valley, and major cities in the Midwest, as well as the nation’s capital. The chair also garnered attention with 4,428 mainstream media hits, a number that is still rapidly growing. Print media circulated to 291.7+ million, while 15.6+ billion unique viewers visited websites carrying the article. 4) Wait, how do I know you aren’t sneakily telling the truth? The answer to question 3 is a lie. 5) All right, I’ll let it go. Just know that I’m aware that at any point you could be LYING. So. You studied philosophy and logic. Do you use that in your fiction? Absolutely! There’s a long tradition of slipping philosophy into speculative fiction, especially since they’re both about exploring ideas and taking them to their logical conclusions. Some of my favorites are Italo Calvino’s “All at One Point” and Asimov’s “The Last Question” for metaphysical cosmology, Ken Liu’s “Mono No Aware” for ethics, and Roald Dahl’s “William and Mary” for epistemology, and the movies Labyrinth and Monty Python’s Holy Grail for classic logic. Also the entire Discworld series for all the philosophy ever. Okay, those aren’t really cakes. The two in the middle are pancakes with bean paste inside, and the top and bottom ones are a kind of wafer-cookie sandwich, also filled with bean paste. Still. Close enough…. (18) RUN A LINE THROUGH IT. “SFWA Contracts Committee Alert” at the SFWA Blog. The SFWA Contracts Committee believes there are serious problems for writers with the non-compete and option clauses in many science fiction and fantasy publishers’ contracts. The non-compete language in these contracts often overreaches and limits authors’ career options in unacceptable ways. Writers may choose to bring out a range of books from different publishers — science fiction from one publisher and fantasy from another publisher, for example — and may have to do so in order to earn anything like a living wage. The problem becomes even worse for hybrid authors who self-publish works in parallel with their traditional publications. Several contracts that we have seen include overlapping restrictions that could keep the author from publishing another book for more than a year…. Any limitation on the author’s ability to write new works at any time is unacceptable and should be deleted. “Competing work” should be defined in the contract as clearly and narrowly as possible, and preferably limited to a work in the same series (whether one is planned or not). The burden should be on the publisher to prove that another work published elsewhere by the author would reduce their sales. (19) THRONES RETROSPECTIVE. BBC devoted a long post to “Game of Thrones at 20: How the saga became a TV hit”. Still, HBO wavered over whether to make a fantasy show that would be so drastically different from their trademark series, which tended toward the grittily realistic. And even after HBO tentatively signed on, Benioff and Weiss’s original pilot episode had to be completely reshot before the show finally debuted in 2011 – another six years after the producers had first acquired the rights from Martin. But there was hope from another perspective: the rise of prestige television had paralleled the rise of cult fandoms. The passionate online exchanges among fans of books like Martin’s made them desirable targets for marketing. Suddenly, HBO had proof that a Game of Thrones series would have an intensely engaged audience from the start, and the network’s marketers knew exactly how to reach those fans – right on those websites and message boards where they gathered to discuss the minutiae of the books. If the network got particularly lucky, those fans would become ambassadors to a wider audience. (20) HEAD OF THE CLASS. Entertainment Weekly explains what went down. On Wednesday’s episode of The Late Late Show With James Corden, host James Corden and some high-wattage Game of Thrones cast members spoofed House of Black and White’s Hall of Faces (a prominent part of the show’s season 6 marketing campaign), with a segment imagining what an obnoxious disembodied head might do to the larger group.